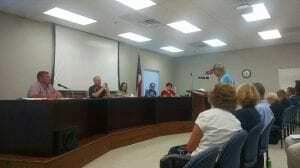 Blue Ridge, Ga. – There was no shortage of comments as citizens filled the public commentary portion at the Board of Commissioners (BOC) meeting to express their outrage over the recent handling of Chief Tax assessor Dawn Cochran. After reading about the exchange between county commissioners and Cochran in local media, citizens of Fannin County spoke in defense of the Tax Assessors department. 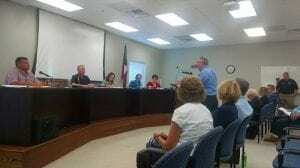 Fannin County citizen Frank Moore spoke of his outrage over the recent handling of Chief Appraiser Dawn Cochran. Moore also expressed concerns over recent Board of Assessors (BOA) appointment Angelina Powell. “And who’s the person that would actually put Angelina Powell on the Board of Assessors instead of that man right there?” Moore asked motioning to former BOA Chairman Lane Bishop. Others who spoke were just as angered as Moore over the questioning of Cochran’s education. Smith also stated that the commissioners’ behavior toward an employee could be very discouraging for other personnel who might now be intimidated to ask a question. Sandra Daugherty of Sugarcreek agreed with Smith’s perceptions of the BOC possibly making it difficult for county employees to come to them with questions. Former BOA Chairman Lane Bishop accused commissioners of still using the “good ol’ boy” system. After agreeing to discontinue the profanity, O’Steen was allowed to continue speaking. Unlike many of the other speakers who were focused solely on Helton and Fannin County Post 1 Commissioner Earl Johnson, O’Steen also accused Fannin County Post 2 Commissioner Larry Joe Sosebee of negative behavior in the meeting. While people certainly expressed their outrage over the perceived treatment of Cochran, many were also displeased with the option that was presented of outsourcing some of the of the workload of the Tax Assessors office. It was proposed at the June 12 BOC meeting to look into a contract with Georgia Mass Appraisal Solutions & Services (GMASS). In this contract, GMASS offers to appraise a third of the counties parcels each year for three years. This would keep the county in compliance with Georgia state standards. The GMASS contract would cost taxpayers a total of $784,000 for three years of service. Chairman Helton pointed out that Fannin County’s total yearly budget for the Tax Assessors department is far more than surrounding counties, and this contract could be a way to alleviate some of the financial burden on the taxpayers of the county. “What they’re (tax assessors) not telling everyone, is they already are using this company(GMASS),” Johnson said of the proposed contract. 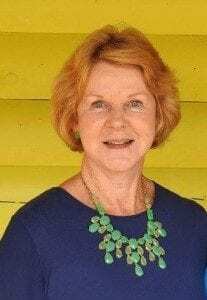 Chief Assessor Dawn Cochran did confirm that she had planned on asking for help in 2019 with approximately 13,000 parcels. “I have not had to raise the mileage. I didn’t get elected to look at the tax assessors. 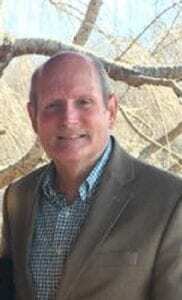 I got elected to save taxpayers money,” Johnson concluded his feeling about the public commentary. 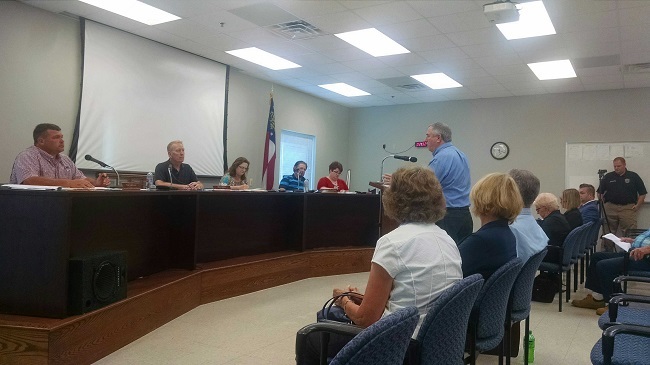 BLUE RIDGE, Ga. – Fannin County Board of Elections and Registration (BOEAR) continues to prepare for the upcoming elections in 2018. Margaret Williamson will face David Ralston in the Republican Primary for Georgia House of Representatives, District 7 seat. With candidates, such as Glenn Patterson for Fannin County Post 2 Commissioner and Margaret Williamson for Georgia House of Representatives District 7, already announcing their intentions to run in the scheduled May primaries, the BOEAR has much to prepare for this year. The BOEAR will see new faces on their board as well this year. The board, composed of two appointed Democrats, two appointed Republicans and a fifth member decided by the appointed members, will all be up for reappointment this year having served their two-year terms. One member that will not be seeking reappointment is John Baird. 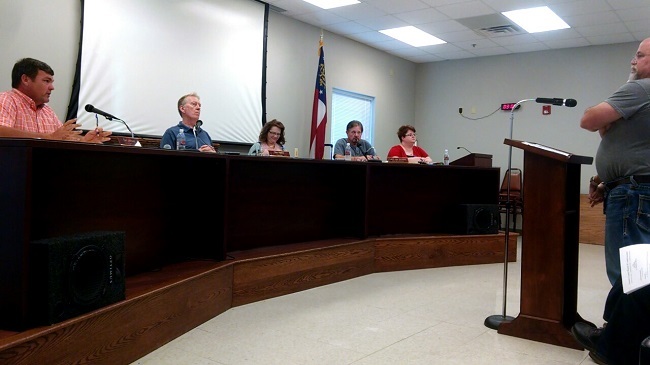 Baird having served on the board for two years will be leaving Fannin County in the near future. This will leave the Democratic seat held by Baird open for a new Democratic appointment to fill. Members of the Board of Elections and Registration are nominated by their parties respectively, and then voted on within that party to fill the board. Board members are preparing to attend the Georgia Election Officials Association (GEOA) and the Voter Registrars Association of Georgia (VRAG) joint conference held March 25 to 28 in Athens, Georgia. Attendance to this conference in mandatory for two members of the board and will keep Fannin County in compliance with Georgia state law regarding elections. Glenn Patterson seeks a position as Fannin County Post 2 Commissioner. The BOEAR also announced the proposed qualifying fees for county positions. These fees were later passed by the Board of Commissioners. A fee of $349 is required to run for Fannin County Post 2 Commissioner, and $144 is required to run for a seat with the Board of Education. The qualifying period for these positions begins March 5 at 9 a.m. and will close on March 9 at noon. Winners of the primaries will face off in the General Election to be held on Nov. 6, 2018. Another position that will be seen on the ballot in November is that of the Blue Ridge Mountain Soil and Water Conservation District. The Blue Ridge Mountain Soil and Water Conservation District is represented by two district supervisors. One of the supervisors is appointed to a two-year term while the other is elected to the position and serves a four-year term. Currently, Fannin County is only represented by one district supervisor, Damon Davenport. Richard Stanley, the elected official, passed away in late September of 2017. The seat of the late Richard Stanley will be open to candidates in the 2018 election. To fill the vacant seat within the Blue Ridge Soil and Water Conservation District, one must petition the state of Georgia and meet certain requirements to be put on the ballot. Conner pointed out a change in requirements for this position, “They have upped the petition from 20 names to 25 names.” Names on this petition must be from registered voters and can be filed with the Fannin County Board of Registration and Elections. « Previous Article Future Fannin Rebels Rout Young "Cats"